Based upon the true story of Odette Meyers, a Jewish survivor of World War II, this novel in verse tells the story of a young girl forced from her Paris home by the German occupation. Her father has gone for a soldier, and her mother must stay behind, so she is sent with two other little girls to the country where they and other children are sheltered by a Catholic family. For the time being, Odette must become a Christian girl, learning the prayers and attending Mass, pretending for several years that she is someone other than herself. When rumors circulate that she is Jewish, she is chased and beaten by her schoolmates and becomes so scared that she stops speaking, even to her mother. Maryann Macdonald's lyrical rendering of Odette's life richly conveys the rising fear and horror of occupied France as Jews began to be deported to the camps. Good people of every religious persuasion rose up during that time to save their countrymen, and Odette's family, against all odds, survives the War. 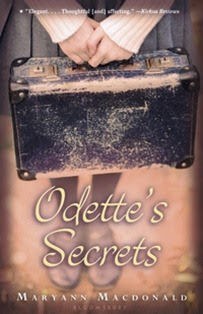 Odette's Secrets is an excellent addition to the growing body of Holocaust literature for children, especially for fifth grade on up.